TimeCamp is time tracking system with multiple features that allow you to monitor computer activity. On top of logging time, this system helps track your employees’ activity to ensure they are keeping on task by collecting data to generate reports on application and webpage usage. Not only does it keep your employees honest and focused; TimeCamp also gives you the ability to categorize and automatic calculate the productivity of your employees’ time spent at the computer and – optionally – set up a way to account for time spent away from your computer as well. If you add multiple users (employees) to your account, user picker will appear on the right side of the panel. With this tool, you can select the employee(s) you want to generate a report on. If you’re tired of looking at singular reports, this app also comes with a group report function, which will be discussed later. To select the user, simply click on the drop arrow marked in the PEOPLE box. This will give you a full list of registered users assigned to your account. To select an employee, simply click on his or her name. To select multiples, click on the checkbox next to each name you want to have in the report. The basic view presents a summary of time spent by the user in the selected time period. A more in-depth analysis can be performed by selecting a predefined period or by setting up your own using the calendar to designate the time period being appraised. Basic indicators show a brief summary of the time recorded by the desktop application. 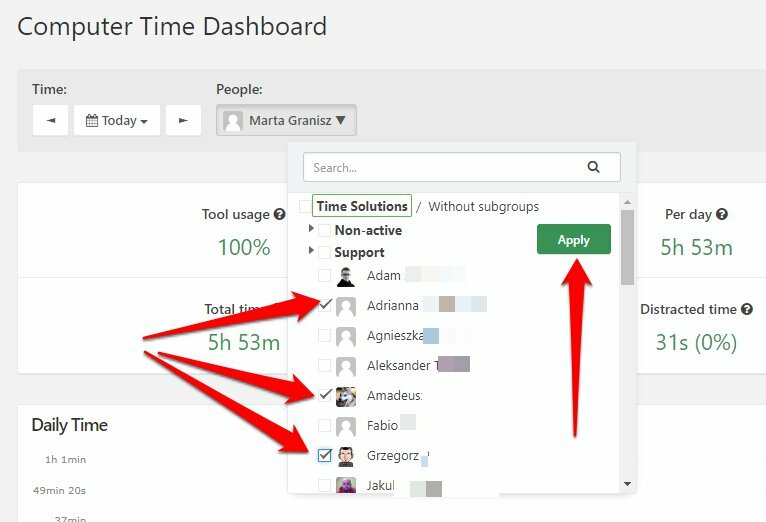 The Tool Usage indicator shows the percentage of time spent on applications qualified as productive or neutral. Of course, you can adjust your own parameters determining the productivity of the application or website. The Per Day indicator calculates the average of daily time spent on active work on a computer in the selected time period. The Total Time indicator presents the sum of registered time in a given period during active work on the computer. The Distracted Time indicator shows the total and the percentage of time spent on applications and websites categorized as unproductive. The Day Time chart represents the sum of the time collected each day in the selected time period. Please note that the bars in the chart are interactive. If you click on one of them, you will be transferred to a detailed summary of the selected day. If you select a single day as a time period, the graph changes to present the time gathered at particular hours of the workday. By clicking on a bar corresponding to a particular hour, you will be redirected to the detailed view in which activities are listed second by second. Bar graphs at the bottom of the page present time divided into individual applications/websites and categories to which the activities are assigned. Activities labeled as unproductive are marked in red. We said we’d get here eventually. 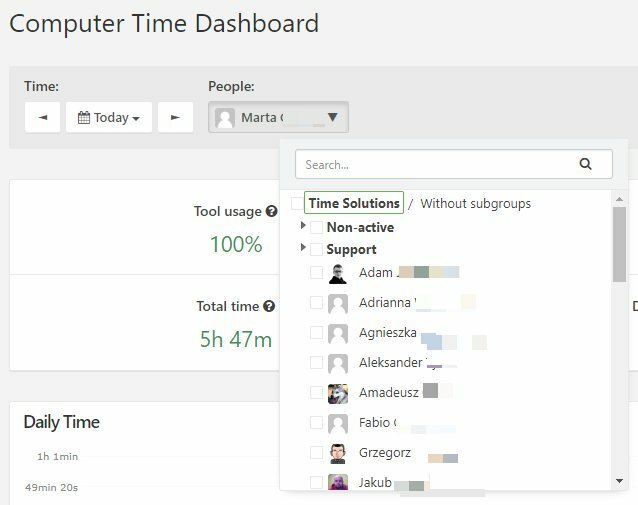 TimeCamp allows you to generate group reports. Much like when generating single user reports, you return to the PEOPLE drop menu and select the users, only this time you do so by clicking the boxes instead of the single individual. You can also select all users from the group by clicking on the main group’s name. At the top of the group summaries, you can find average values recorded for selected users in a given period of time and a list of the most common activities. In addition, a brief summary is presented for each of the selected employees. To go to the detailed report for each user, simply click on his or her name.